(NaturalNews) Between what happened in Ferguson and on the campus of the state's largest university, Missouri's reputation has taken several hits over the past year. But one of the most memorable of all moments was when a communications professor at an institution believed to have started the country's first official school of journalism, attempted to resort to violence in order to quash the First Amendment. Now, it seems, she may finally have to answer for it. 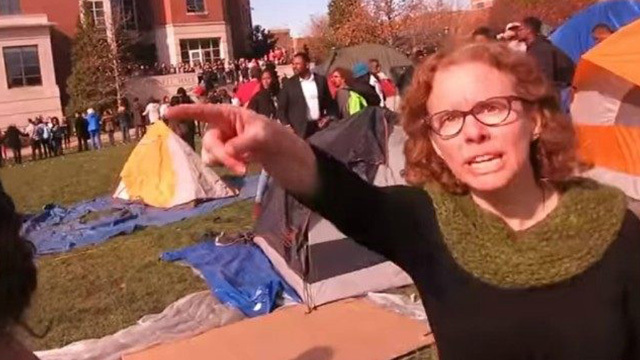 As reported by Fox News, some Missouri state lawmakers are calling on the University of Missouri to fire Prof. Melissa Click, after calling for "some muscle" to eject a student reporter out of a demonstration that was being held on public property. Click made national news in November when her attempt to get the student reporter tossed was captured on video and went viral. The student, who was attempting to file a report for ESPN, was on the school's quad during a protest over alleged racism at the school. "Who wants to help me get this reporter out of here?" Click screamed out after correspondent Tim Tai refused to leave. "I need some muscle over here," she said. The Nov. 9 incident came as students protested the racial climate on campus and reacted to the earlier resignation of former school President Tim Wolfe. Video of the confrontation went viral and drew nearly 3 million views, igniting a nationwide debate on the First Amendment. As the video and Click's story continued to circulate around the country, critics seethed over the thought of a university professor not only taking an active part in a student-led protest, but also someone who is affiliated with the centuries-old journalism school attempting to thwart a reporter from reporting the news. As a result, she lost her courtesy appointment in the journalism school, and was accused of assault and violations of Title IX, but she remains an untenured professor at the state's namesake university. But now, some 100 House Republicans in the state Legislature, and 18 members of the Senate, have penned a letter to the school's board of curators demanding her "immediate firing," Fox reports. "The fact that, as a professor teaching the communication department and the school of journalism, she displayed such a complete disregard for the First Amendment rights of reporters should be enough to question her competency and aptitude for her job," says the letter, written by Rep. Caleb Jones and Sen. Kurt Schaefer. In addition, the lawmakers sought answers about Click's taxpayer-funded research into goofy topics like 50 Shades of Grey, the entertainer Lady Gaga, and the Twilight series. In recent days, one of the university's curators, David Steelman, joined in the call for Click's firing. As reported by the Columbia Daily Tribune, Steelman, in an interview with the paper, acknowledged that the board has only limited authority to fire Click. And since he is not the board's chairman, Steelman does not have the ability to place her continued employment on the board's agenda. "She is not just an embarrassment to the university or the state of Missouri, she yelled 'fire' in a crowded theater," Steelman said. "A great university cannot remain great unless it doesn't tolerate professors who do that." At present, the board is conducting a search to replace former president, Tim Wolfe, who stepped down Nov. 9 after being pressured to do so by students who claimed his policies did not go far enough in reducing racism on campus, though the student body never really produced any evidence of widespread racism. "The legislature ... and the governor, who had his own statement, both of them recognize that Melissa Click's actions were not just inappropriate but also potentially dangerous to students," Steelman said. "I have no problem with a state that is putting half a billion dollars into the university wanting to have some oversight." The paper reported that a group of 116 faculty members at UM issued their own letter supporting Click.